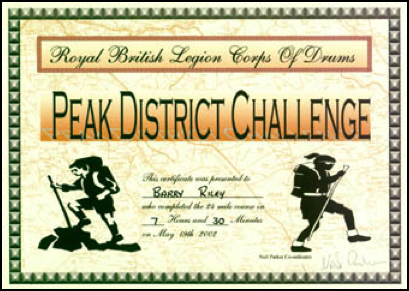 Mick and I did the Peak District Challenge in 2000 and really enjoyed it. Click here to see my report on it. We had hoped to do it last year but, like so many challenge walks, it was a casualty of Foot and Mouth Disease and had to be cancelled. This made us keener to stretch our legs and have a go in 2002. Like so often before a walk the weather report was indecisive and the night before I had the usual problem of what to wear. Would we get rain during the walk or would it hold off until later in the day? The weather forecasters didn’t seem sure. As it was, it turned out to be very suitable weather for walking - sunshine with a pleasant breeze and only occasionally overcast skies. As usual it was an early start to reach the walk venue at Sheldon, located south of the A6 two or three miles from Bakewell, for the mass start at 9 o’clock. While waiting I spoke to other walkers and met up with the infamous St John’s Lady, "Vaseline Val", and counted approximately twenty walkers waiting to use the one working loo that was available at the village hall which was the start/finish for the event. Mick and I, like many others, were therefore beginning to wish we had not bothered with the pre walk cup of tea when the walk started and we walked down the road, and over the fields past the Magpie Mine to Over Haddon. 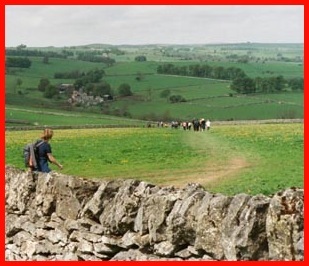 Fortunately Over Haddon because of its closeness to Lathkill Dale gets plenty of visitors and plenty of visitors means it has toilets and they were on our route. We really walked fast to Over Haddon and did the three miles in less than 50 minutes. Sometimes loos can be a great incentive. 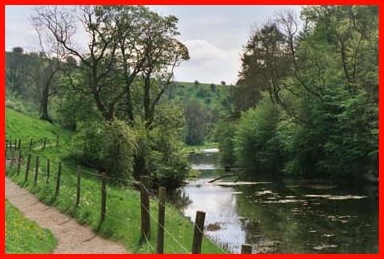 From Over Haddon we followed Lathkill Dale downstream to Alport and the first check point. From here it was a pleasant stroll along the Limestone Way on the banks of the River Bradford which, like the Lathkill, is so clear and clean that dozens of trout could be seen gliding through the water. But this enjoyment would soon come to an end. To get to the next check point we had to climb out of the Bradford Dale to the Long Rake Car Park, an ascent, if I’ve read the contour lines on my map properly, of about 400 feet. So before the climb I had a Snickers, they always help at times like this, got my walking poles off my rucksack and I was off. However, It was still a big relief to get to the top and enjoy a drink of cool water, a biscuit and know that we had 7½ miles behind us and also probably the biggest ascent of the day completed. The next stop was Monyash, 3 miles away, which took us an hour and 8 minutes. We were not quite as quick as we had hoped but the route did take us through the Cales Dale, which can be an ordeal with the 160 plus steps down into it and then a clamber out. Walking poles yet again were very useful. It was also pleasing to note the number of gates that had been placed along the path and thus eliminate having to make the often difficult clambers over wall stiles. As per usual we did not linger long at the check point and from Monyash we were getting into an area that we had not walked before. It was also here that I realised that I had placed a wrong grid reference into my GPS which I used all day to give directions. However, other walkers were close by and I had a quick look at their map, and set the GPS to direct me to the next check point, Flagg Moor, which was just before the Bull-i-th-Thorn Hotel on the Buxton to Ashbourne Road. 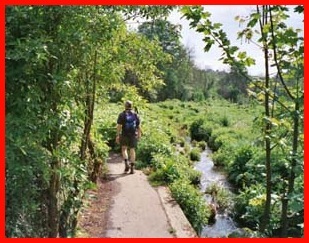 Having enjoyed our lunches (I had Tuna Rolls) along this stretch of the walk we had to resist the temptation to partake of a "swift half" at the "Bull" and soon had crossed the road and headed to Hurdlow. Hurdlow, which is a collection of about a dozen houses, was interesting. Just before we reached it we, and other walkers, had to negotiate a field with a bull in the corner where the exit stile was. We were all very nervous especially a lady with a red T shirt who made sure I was between her and the bull. Fortunately the bull’s carnal instincts came into play when he spotted a beautiful looking cow – at least I presume the bull found her fanciabull – on the other side of the wall. However, it was only a low wall, and he was a big bull, and she was willing to back towards the wall, so we all got over the stile safely as the bull placed his front legs over the wall and extended his "undercarriage" to make appropriate contact. We then walked through Hurdlow. Everything in Hurdlow seemed very "run down". It seemed that every building we passed had its adjacent land used for storing old tractor tyres and all kinds of old farm machinery that was gradually rusting away. However, we were not feeling sorry for the poor farmers for too long as the six or so cars that passed us on this lane were all big 4 wheel drive vehicles. 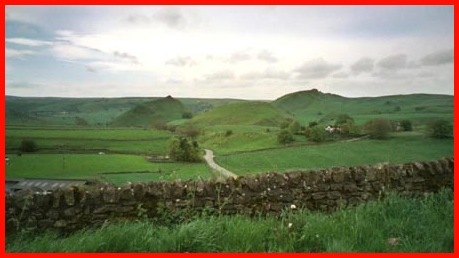 The next stop was Earl Sterndale and which we reached by going along a path north of the road between Hurdlow and Earl Sterndale. Initially it was up hill and as we neared the top we saw to the north quarries that dominate the landscape in this area. Indeed if you look at the map you would almost think that the Peak National Park has had its boundary drawn so these quarries can exist. I’m certain that more of this area would have been included in the P.N.P. if it were not for the quarrying that takes place. Going downhill to Earl Sterndale we met some of the most spectacular scenery of the whole walk. 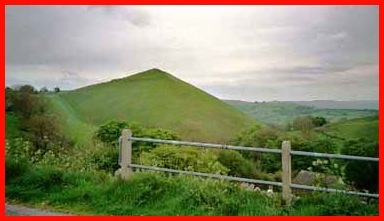 First we saw the almost conical symmetry of Weldon Hill and as we reached the road, which we followed to Earl Sterndale, we had wonderful views of Parkhouse Hill and the other nearby steep sided outcrops. I must come here again and have another look. 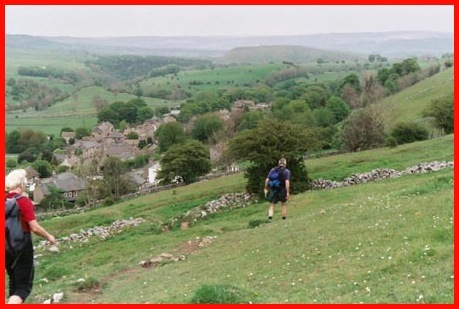 The check point in Earl Sterndale was at grid reference 089675 and adjacent to the path that would take us up a very very steep hillside on to Sterndale Moor and "wonderful" views of the quarries. The first few yards of this path went through a beautiful rock garden. In fact the path was so much a part of the garden that the check point had been placed there so the stewards could point us walkers in the right direction. We could have easily mistaken the path to be a part of the garden and ignored it. Once high on the hill the views to our west were even more spectacular. But soon we were over the brow of the hill and walked adjacent to the quarried areas until we re-crossed the Buxton to Ashbourne Road. The path we followed from here took us north east to Chelmorton with all its small beautifully walled fields and for us the last but one check point. Like the Monyash and Earl Sterndale check points it was at point in the village where our route changed direction at a turn that could have been missed if the check point had been placed elsewhere. Obviously the organisers had considered this very carefully when deciding the position of the check points. 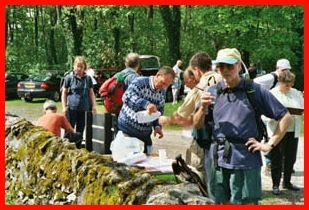 From Chelmorton we continued up and via Sough Top we reached Taddington and the last check point. We now had only 3 miles to go. So down the road we went, took the right fork for Over Wheal and the top end of the Deep Dale, which I crossed slowly. It’s very steep going into the valley and just as steep going out. We could have crossed the dale a little bit further south but it would have added another ¼ mile or so on to our journey so I made good use of my walking poles to get me in and out of the dale. Needless to say Mick got to the top before me but waited and then accompanied me on the leisurely stroll across a few more fields to journeys end. I had expected we would complete the "challenge" in 8 hours. As we neared the village hall we realised that we were very close to doing it in 7½. Mick saw the walker in front, the lady in the red T shirt who, although looking quite old, was quite fit, make a dash to try and beat the 7 hours 30 minutes. Mick did likewise. I can’t run with walking boots on so I did finish a little bit behind Mick but I still was given the same time as Mick - 7 hours 30 minutes - although he reckons he got in a good minute in front of me! "The Walkers Supper" was one of the best I’ve had. Before the walk the organiser, who was also the starter and the cook, said we would get the best steak pie we would ever taste. Not sure if it was the best ever but it would certainly take some beating. Very enjoyable. Some even reckoned it was worth walking the 24 miles for such a treat. After cups of tea and biscuits we received our certificates and a souvenir mug and then Mick was a bit naughty. He whispered to this lady, the one with the red T-shirt, "I hope you don’t mind me asking but how old are you". He, like me, was amazed that someone who looked as if she was well into her sixties could walk so quickly. She wouldn’t tell him but she did say she was younger than she looked. So we were no wiser. Needless to say on the way home we needed a celebratory drink which we had at the Devonshire Arms at Beeley and then it was over Beeley Moor to Chesterfield, to beat the traffic jams coming out of Chatsworth Park, and home.